Patrick Gaffney (b. 6 February 1949) — the senior-most teacher amongst Sogyal Rinpoche’s students. Patrick Gaffney was born in England and studied at Cambridge University, where he first met Sogyal Rinpoche. He has served as Rinpoche’s personal assistant since the mid-nineteen seventies, and throughout that time has played a key role in the development of Rinpoche’s work to bring the Buddha’s teachings to the West. Patrick is one of Vision Board members of Rigpa—the international network of Buddhist centres and groups founded by Sogyal Rinpoche. He is responsible for editing Rinpoche’s teachings for publication, and was co-editor of Rinpoche’s groundbreaking book, The Tibetan Book of Living and Dying. He has also edited two of His Holiness the Dalai Lama’s books, Dzogchen—The Heart Essence of the Great Perfection, and Mind in Comfort and Ease: The Vision of Enlightenment in the Great Perfection. 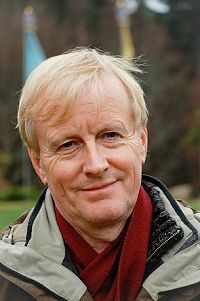 Patrick teaches regularly at retreats and public events in Rigpa centres around the world, and he assisted Rinpoche in guiding students during the three-year retreat at Rigpa’s international retreat centre, Lerab Ling, in France, which concluded in November 2009. This page was last edited on 21 March 2018, at 11:36.